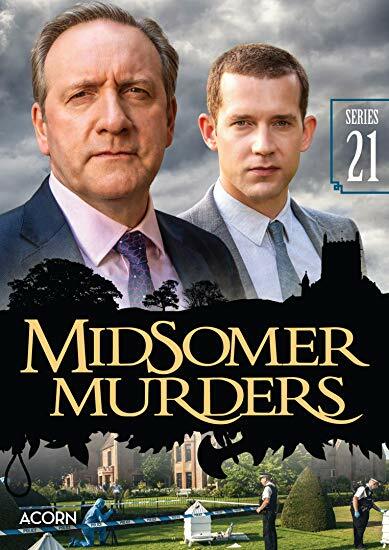 MIDSOMER MURDERS is a long-running (15 years and still in production), fairly popular (although more popular in the early years than now) police detective series set in the fictional county of Midsomer, England. DCI Tom Barnaby (John Nettles) has retired and been replaced by his cousin, DCI John Barnaby (Neil Dudgeon), formerly a copper in Brighton. DS Jones (Jason Hughes) is partnered with the new "Barnaby" although things do not go smoothly. Apparently Jones is miffed that he was passed over for the promotion although realistically he is way too young and inexperienced for the position. For his part, DCI John Barnaby is quite willing to allow Jones the lead (and just enough symbolic rope to hang himself with). Recurring characters seemed to be limited to one — Dr. Bullard (Barry Jackson) — who seems to be in a bit of a funk himself and disappointingly comes across as not really caring anymore whether a death was by natural causes or unnatural. This is resolved in a later episode. I was expecting to be disappointed with the direction the series took after the departure of John Nettles and his beloved character, DCI Tom Barnaby, because I had read many of the comments from UK viewers on various message boards. (UK viewers see the episodes at least a year before we have general access to them in the U.S. and Canada.) However, I was pleasantly surprised at how much I have enjoyed the new series, so far. I do miss DC Gail Stephens (Kirsty Dillion) who was a semi-regular series character from previous episodes. I do not like the chemistry (or lack there of) between John Barnaby and his on-screen wife Sarah (Fiona Dolman). I would have preferred she remained unseen though talked about. As in the episode where Jones asks Barnaby how he knew Mrs. Barnaby was the right woman for him. Barnaby replied, "She told me." To end on a positive note, I do like Sykes, Barnaby's dog and confidante. I also enjoy Barnaby's acerbic wit. his new boss DCI John Barnaby don't seem to agree on what's what. to ask for an urgent meeting with Jones but Jones fobs him off. Next, he turns up dead. from the past baffle DCI Barnaby and DS Jones. "The Oblong Murders" — Unfortunately, the title is more interesting than the case. a young woman who took an introduction course and hasn't been seen since. This is no place to start this series, but if you are already a fan, it will most likely be of interest, if for no other reason than to see what happened after DCI Tom Barnaby retired. Just keep your expectations in check. This is definitely not the Midsomer Murders of old. The stories, cases, and acting (especially from some of the guest stars who have played other parts in earlier episodes) seems tired, lackluster, and rather boring.